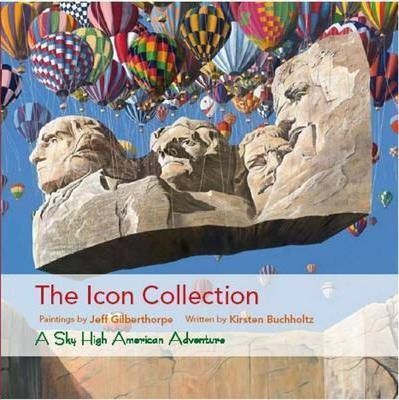 The book follows the fantasy adventures of America's most recognisable icons as they travel on their action-packed journeys from lift-off to a mystical island in the Pacific, and features the now famous series of stunning, vibrant paintings and unique stories by Jeff Gilberthorpe. Jeff's breathtaking, massive American canvases are beautifully reproduced in the book. The images are accompanied by story highlights of action, adventure and absorbing detail that will keep the reader fascinated and coming back for more. It is definitely the kind of book you can pick up any time and always find something new. 'The Icon Collection' is the story of our fantasy to save the famous buildings and monuments of the world from decay or destruction and what better way than to transport them by hot air balloon? If an artist can paint it, perhaps it can be achieved? We have calculated the weight of the buildings, the strength of the steel cables holding them in place and we have worked out the proper speed depending on the height of travel and direction of the prevailing wind. Well, not really. It is all in our imaginations - Welcome to our Art Adventure!